Depending on how big you make the holes, you can shake out all sorts of things from glitter to seasonings. My favorite shaker use is for cinnamon sugar. The process for turning the crystal light container into a shaker is easy. Using a sharp object, make rounded holes in the lid of the crystal light container. I actually used a tool that removes walnuts from the shells. And now I have a large non breakable cinnamon sugar shaker! I know it isn't a spectacular change the world project, but it's one that saves me from having a big mess with the sugar! Yummy! My mom used to make us cinnamon toast with LOTS of butter when we were feeling icky. Love it. Great idea! 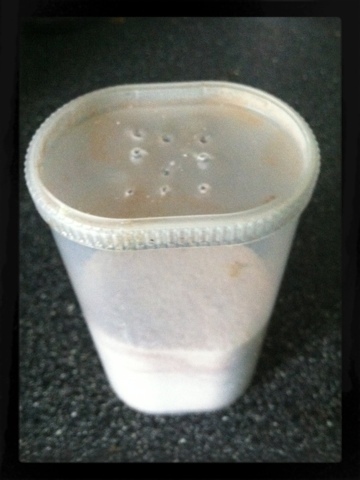 I use those containers to store nails, screws, etc, but have never thought to make a shaker out of them. Stopping by from Wednesday Whatsits. Such a smart and thrifty idea! Would you mind coming by my Creative @ Home Wednesday link up party and share it, I know my readers would enjoy it bunches! Just like Jane above, I used to have cinnamon toast as a kid when home sick from school!